It's waiting for me when I get home from work tonight. The new desk, freshly sanded, and also a quart of greenish grayish paint ready for brushing. I'm trying to get over my love affair with wood. Wood is prissy and high-maintenance. 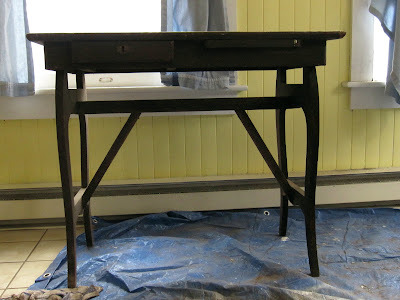 Just when you've found a perfect little desk and hauled it homeward, you're hit with a massive undertaking: the sanding, the stripping, the re-finishing. That is, if you're a die-hard wood lover, like me. There is not one single piece of painted furniture anywhere in our house. Die hard. See? Four weeks. It's time to break out the brushes, folks. ooooooooooo I sure need painting doNE everywhere IN MY HOUSE !!!!!!!!!!!!! Love the desk. My hubs shares the wood love affair. He hates the thought of painting it. I'm so glad you're dealing with your addiction. It's healthy! =) Thanks so much for visiting my blog and commenting! I can't wait to see it. I'm the same way about wood!